If you are charged with retail fraud in White Lake Township, Michigan there are some things you need to know. 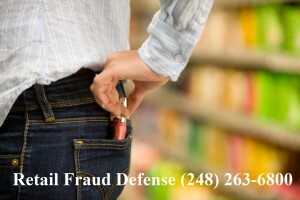 Retail fraud a/k/a shoplifting is one of the most common offenses charged in Michigan. The possible consequences can include jail, prison, extensive probation, classes, community service, fines and costs and much more. There are also outside penalties that are not associated with the criminal charges and courts. These can include loss of employment or inability to get employment, dismissal from school. loss of credit rating and many other serious things. Also, if you are not an American citizen there can be immigration issues involved too. You do not have to face jail, loss of employment or a conviction in many cases. Expert legal representation is your best hope of avoiding the consequences of a conviction. A retail fraud or shoplifting charge can be scary and have a dramatic effect on your life. You need the help of a law firm that will treat you with compassion and dignity. Lewis & Dickstein, P.L.L.C. have the experience, dedication and tenacity to provide the best and strongest defense available. Our attorneys understand that there can be many reasons why the offense was committed and there is no typical person that commits retail fraud. Over the years we have represented people charged with retail fraud that range from the working class to the very wealthy and people with minimal education to having advanced degrees. Lewis & Dickstein, P.L.L.C. has the resources and experience to help you avoid jail and, in most cases, avoid a conviction on your record. Click here to learn more about retail fraud – its degrees and consequences. If you are facing retail fraud charges, call LEWIS & DICKSTEIN, P.L.L.C. at (248) 263-6800 for a free consultation with one of our highly experienced retail fraud attorneys or please feel free to complete a Request for Assistance Form and we will promptly contact you.